Today we made things official by trekking to the eastern end—or in our case, the beginning—of US-80, the old Dixie Overland Highway. 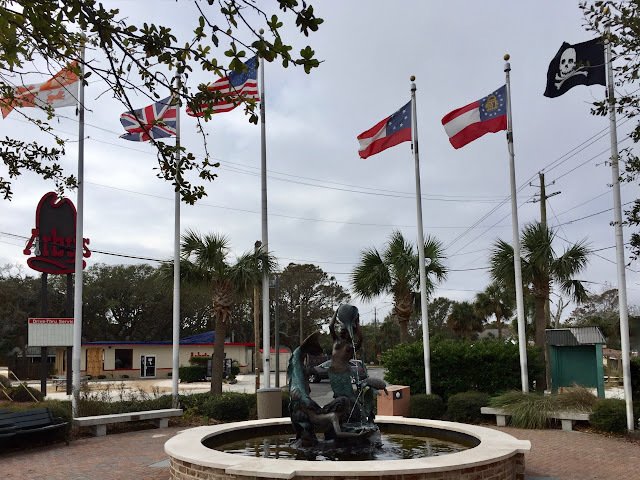 We located the spot about a quarter mile from the southern tip of Tybee Island. In 2008, the Georgia legislature declared that US-80 through the state would be known as the Korean War Veterans Memorial Highway to honor military personnel who served in that conflict. 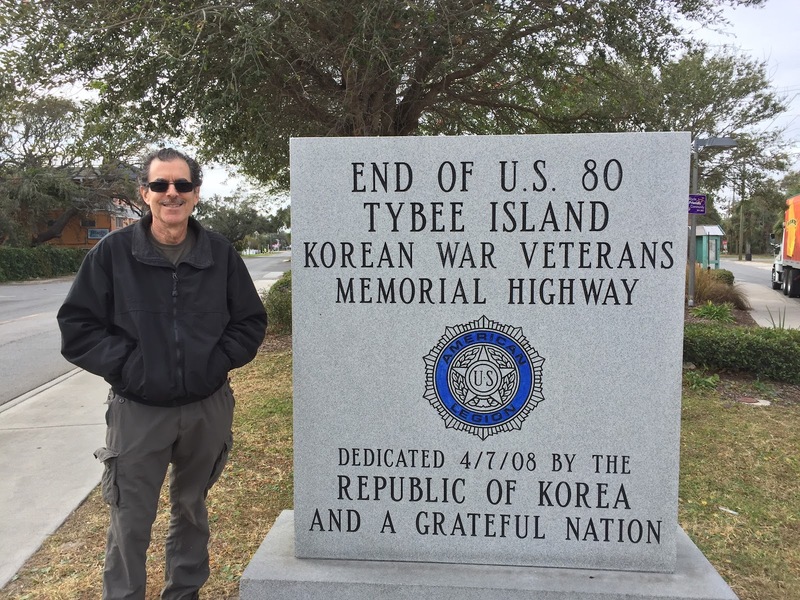 Conveniently for us, Tybee locals erected a sign to commemorate the designation. 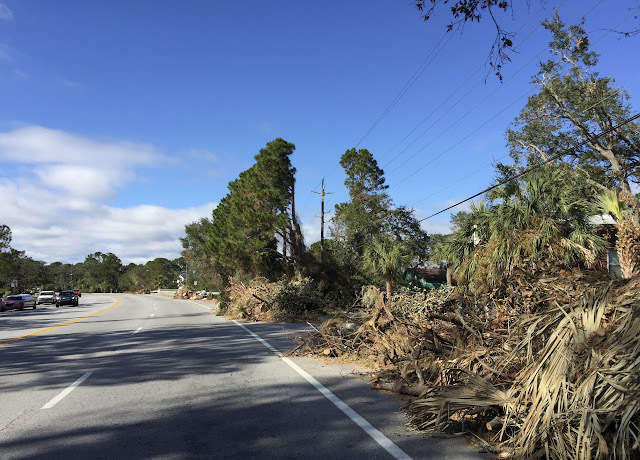 Driving around Tybee we saw many curbside mounds of cut logs, palm fronds and other debris that Hurricane Matthew had ripped down last month. FEMA still lingers in town, offering disaster relief to islanders. 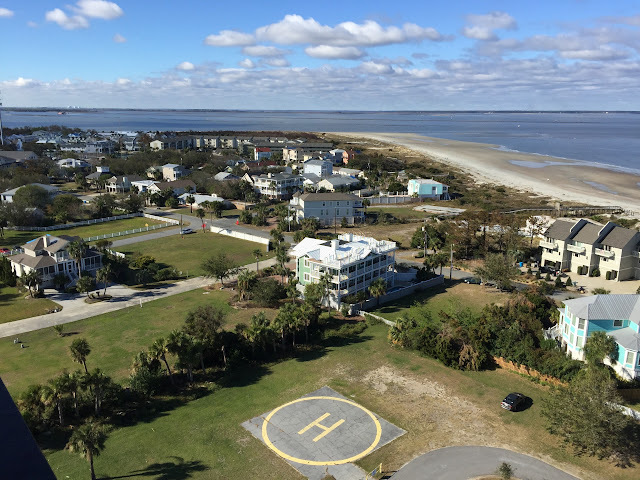 Though Matthew was the worst storm to hit the island since 1898, most of the damage on Tybee was minor—downed trees and power lines, missing roof shingles. Clean-up continues for many, but as the sign on the local IGA food store declares, things are "back to normal-ish." 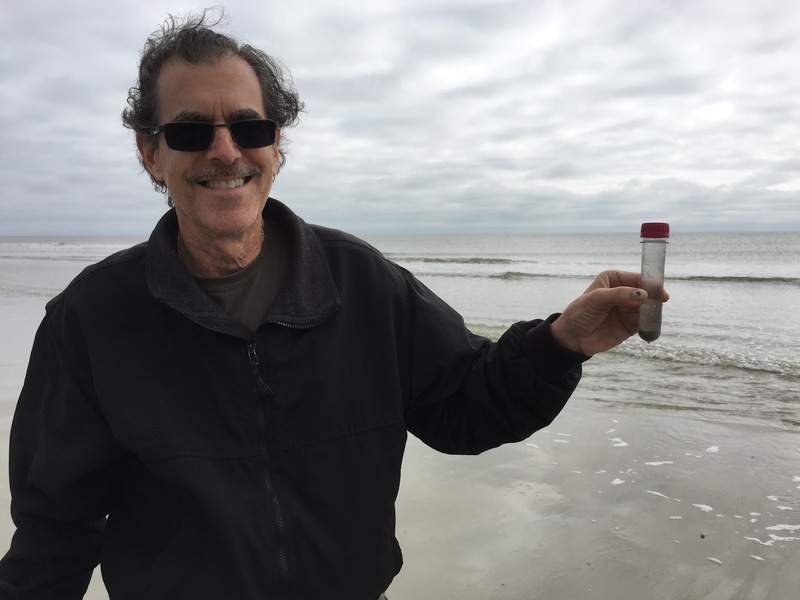 Past the terminus of US-80, we drove to the end of Chatham Avenue at the southern shore of the island to scoop up a sample of the Atlantic Ocean. While there, we also planted a letterbox near the beach access boardwalk to immortalize the beginning of our first transcontinental journey. By that time, we were ready to find some lunch. We trolled the narrow, tourist-friendly Tybrisa Street in search of a likely spot. But Tybee's peak season for visitors is summer, and a number of the restaurants were closed. Scanning the menus of those that weren't, we had the feeling we'd get the reaction we had at a beachside seafood restaurant a number of years ago. "What would you recommend for a vegetarian?" I asked the server. "Eat somewhere else," she replied. 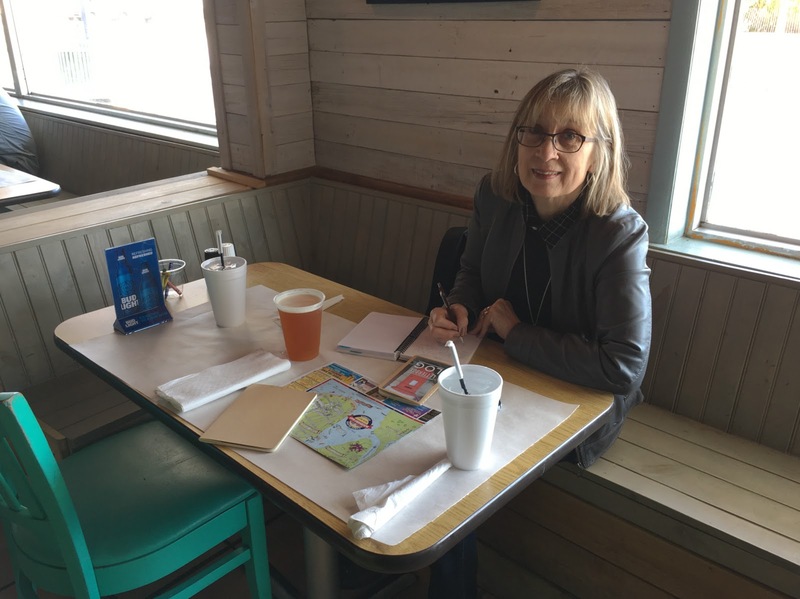 As we were about to give up on finding lunch on Tybee, we stopped and examined the menu at Fannies on the Beach, fully expecting more of the same. We were delighted to be wrong. 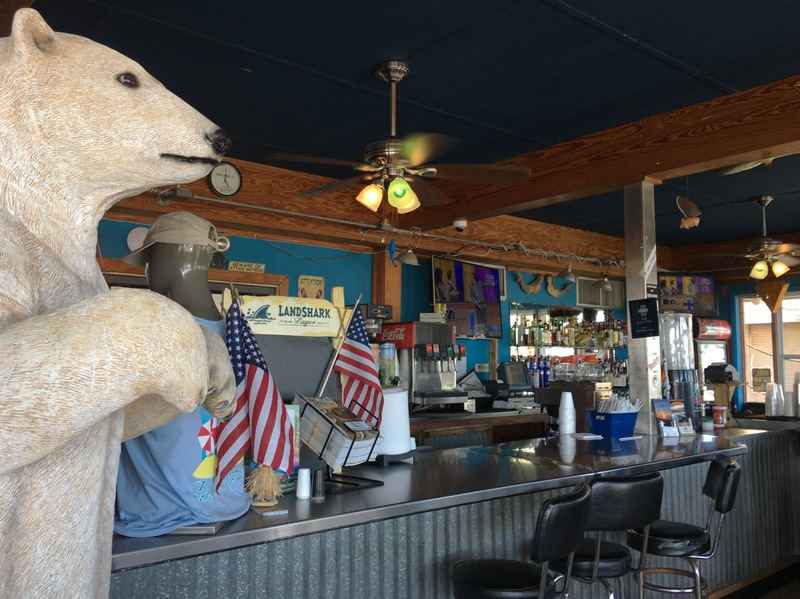 The friendly eatery, separated from the beach by a parking lot, offered healthy alternatives to the all-fried all the time joints. Our amiable server, Jules, was enthusiastic when we told her about our trip, immediately recognizing that we intended to follow Highway 80. AL FRESCO POSTAL SERVICE, BUT WHAT IF IT RAINS? Next on our agenda was visiting the island's lighthouse but we couldn't pass the post office again without stopping to see why so many people were queued up in the parking lot. The line was even longer than it had been when we drove past a couple of hours earlier. When we inquired, we learned that Hurricane Matthew was to blame. 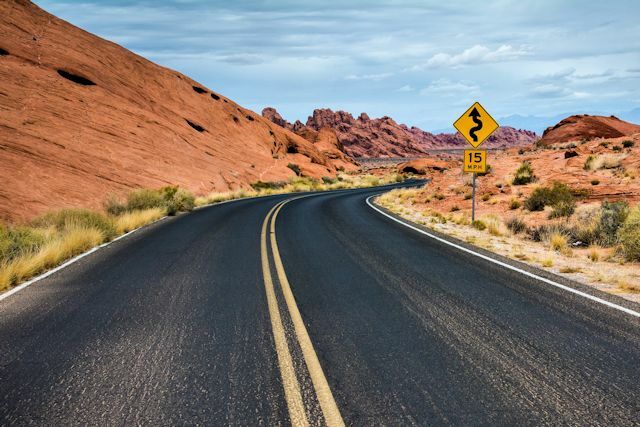 After being closed for two weeks due to storm-related flood damage, the local post office responded to the complaints of residents who were driving ten miles to pick up their mail at a neighboring post office. A mobile unit was set up with a van for stamp sales and outdoor mail pick up service for post office box patrons. Home delivery is still handled from the other office. 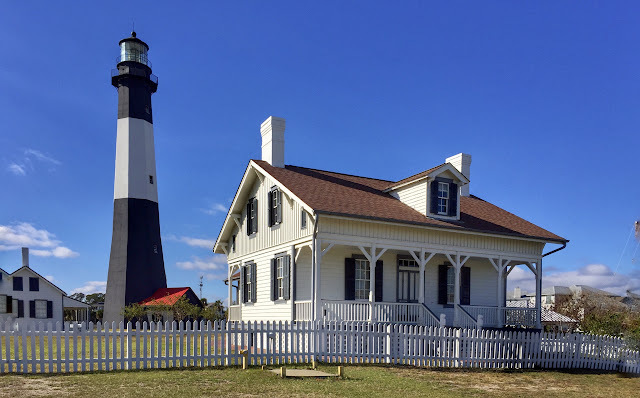 Our curiosity satisfied, we continued north to the Tybee light station. Georgia founder James Oglethorpe recognized the need for a coastal lighthouse when he established the colony in 1733. Under his orders, a wooden tower was built on Tybee Island in 1736. Standing 90 feet tall, it was the highest structure of its kind in America at the time. Over the intervening years, three other lighthouses have been constructed as storms have claimed these maritime sentries. The current watchtower stands 154 feet tall and was completed in 1867. 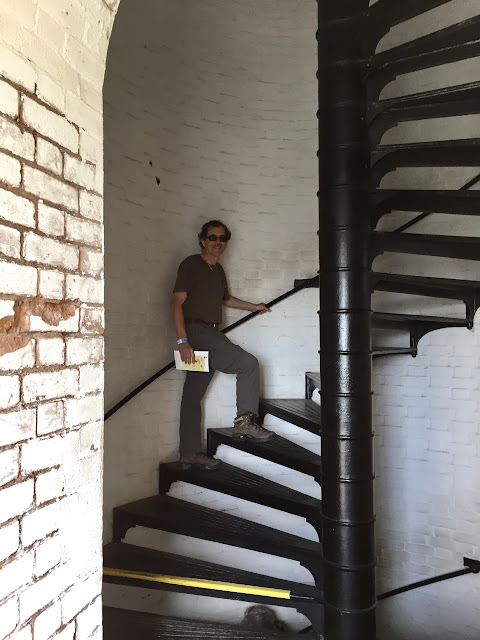 Before and after climbing the 178 stairs to the top of the lighthouse, we chatted with Sandy, the volunteer docent on duty—at the bottom. She has helped out there for many years and even serves on the non-profit's board but has never been to the top due to her fear of heights. Our efforts to persuade her to accompany us were ineffective; it certainly wasn't the first time she's been asked. But she believes that someday she may do it. 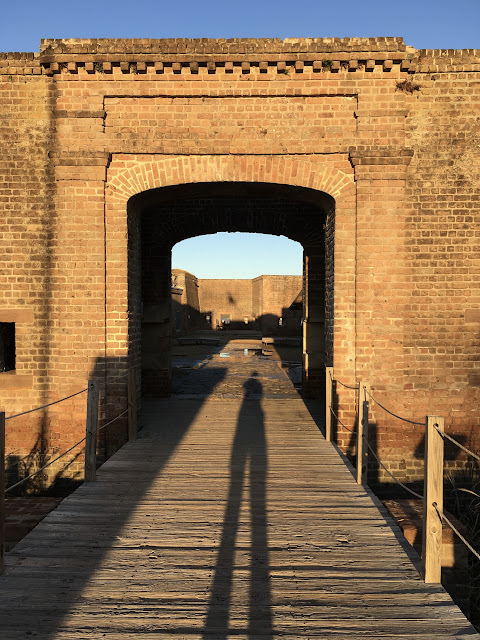 A MAKESHIFT BRIDGE LEADS ACROSS THE MOAT INTO FORT PULASKI. 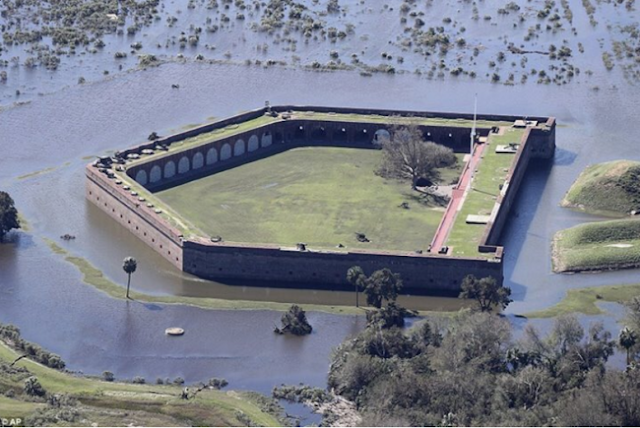 While Tybee survived Matthew with only minor inconveniences and damage, Fort Pulaski National Monument on marshy Cockspur Island nearby was not so fortunate. The hurricane inflicted almost $2 million in damage to the National Park Service unit. More than 400 trees were downed, and one of the drawbridges over the moat disappeared in the storm. The island's dike system failed as the ocean slammed it with a 16-ft. surge. Like south Louisiana's ring levees after Katrina, the dike held the floodwater on the island, giving it no way to drain off, so every building was flooded. This was not the fort's first encounter with disaster. 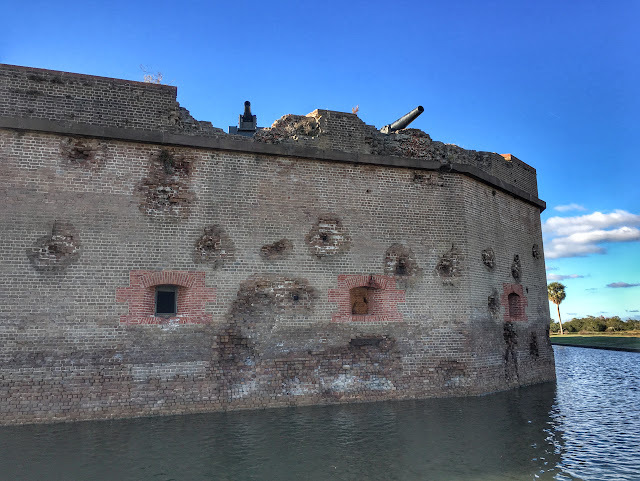 Back when it was built in the early 1800s to guard the river approaches to Savannah, Fort Pulaski boasted 7.5-ft. solid brick walls and was thought to be invincible. And it was, until the development of spinning pointed projectiles fired with precision from rifled cannons. 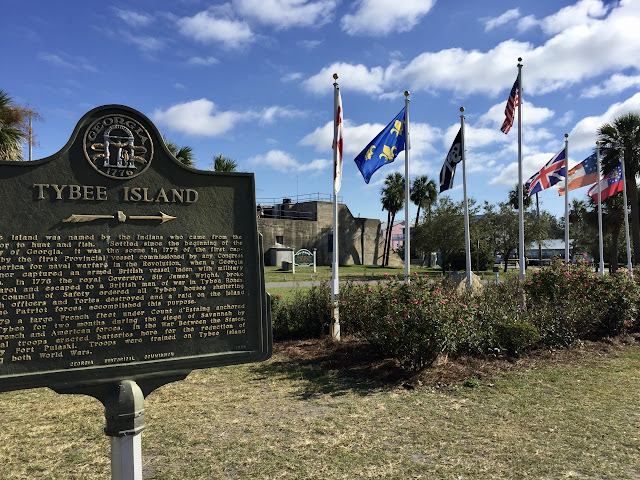 Still considered experimental in 1862 when Union forces used the weapons to oust Confederates from Pulaski, the artillery was so effective that the fort surrendered within a day to prevent the shells from reaching the main powder magazine. Fort Pulaski, scarred and battered, became a symbol of a bygone era. IT WAS LATE AFTERNOON BY THE TIME WE REACHED OLD FORT JACKSON. 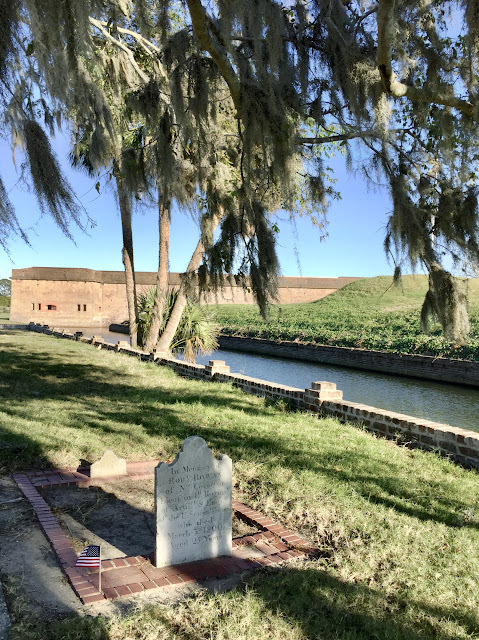 On the way back to Savannah, we stopped at another of Georgia's coastal forts to search for a letterbox. 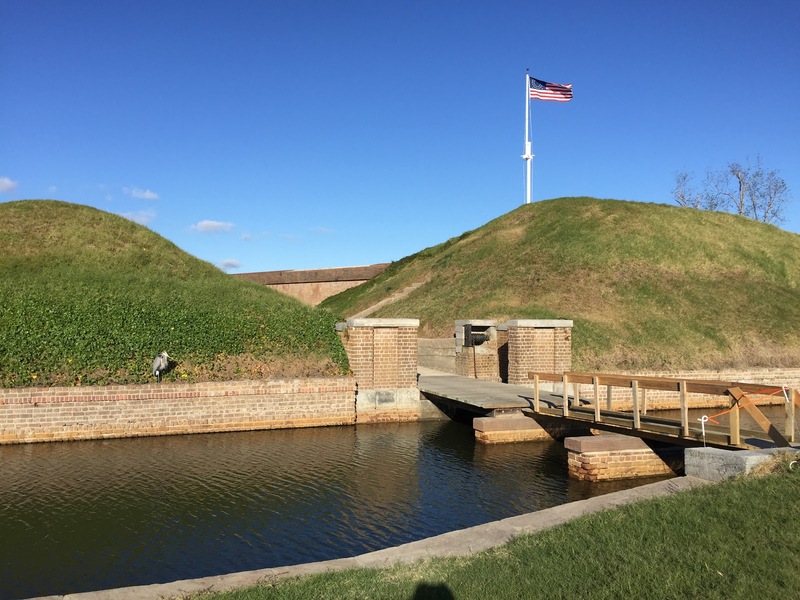 Constructed in 1812, Fort James Jackson was in active use during the War of 1812 and the Civil War. 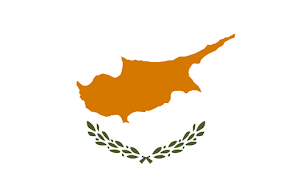 It is owned today by the state of Georgia and operated as a museum. As we were about to leave Old Fort Jackson, a massive container ship, the Mary, came sailing up the river toward the Savannah port. 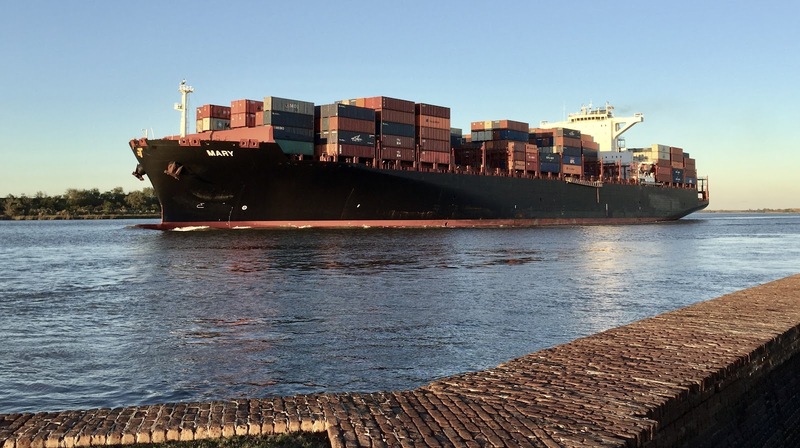 As wide as a football field and as long as three, the vessel was laden with freight but powering along at a good clip. After she quickly passed, we joked that we should race her to our hotel on River Street, a distance of 3.5 miles. Of course, with her path unobstructed and us facing numerous traffic lights and other delays, we never thought we had a chance. NEVER SAY NEVER. 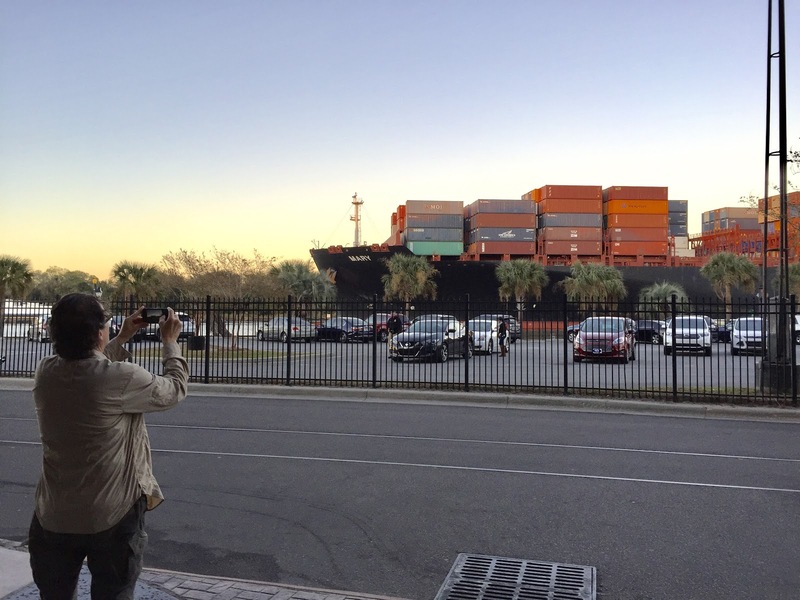 SHE ROLLED BY JUST AS WE PULLED UP TO THE HOTEL. After walking a couple of blocks over to The Pirate's House, Georgia's oldest bar, to find a clever letterbox our friend Karen had hidden in plain sight, we returned to the hotel to prepare for the first leg of our journey west tomorrow. We're not making too many concrete plans, but tomorrow we expect to take the same trip the Savannah Auto Club committee made and end the day in Columbus, Georgia. 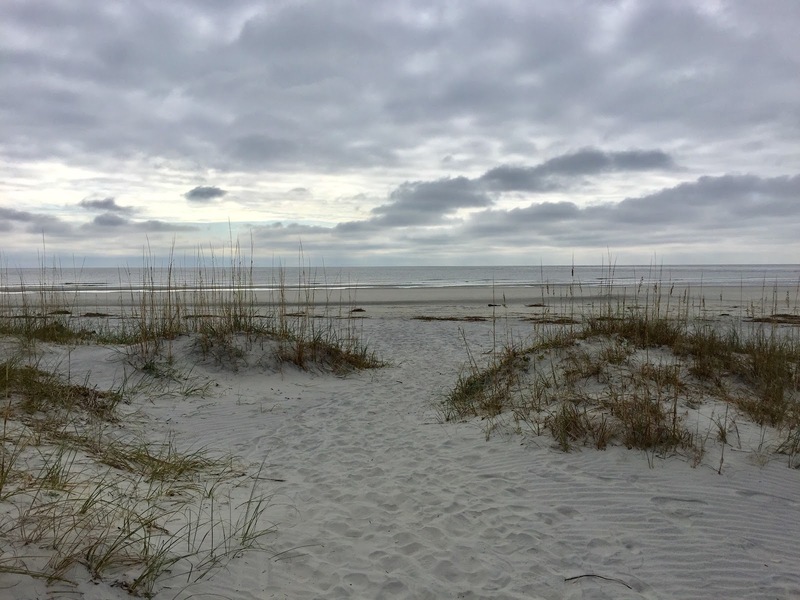 Loved: The warm hospitality on Tybee Island. Everyone we encountered in the shops, museums, restaurants, and even those waiting in line at the makeshift post office was friendly and helpful as could be. 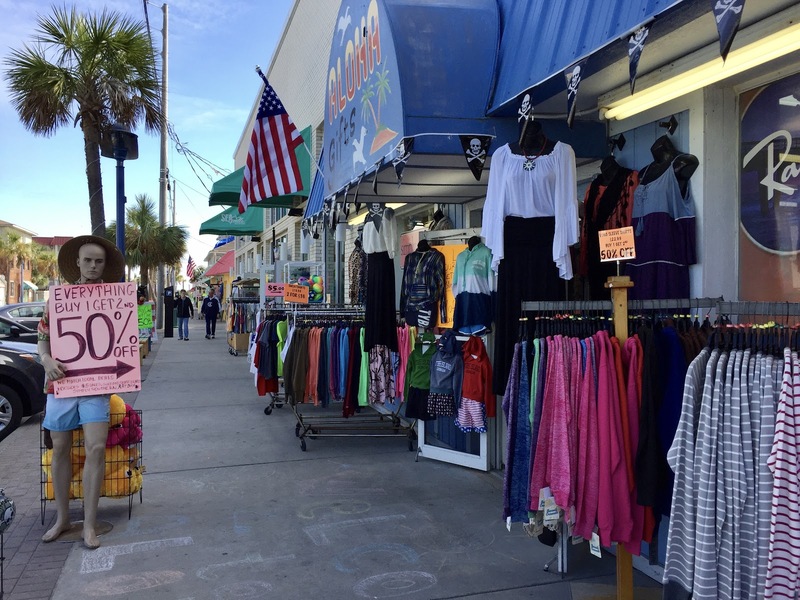 Lacking: Healthy eating options on Tybee. If it ain't fried, it probably won't be served. Learned: That you might just win an impossible race if you only try. And, for the record, you don't need to speed. LOCAL OFFICIALS ESTIMATE MATTHEW LEFT 1,000 TONS OF DEBRIS TO BE REMOVED.